Saturday was a very wet day - lots of swimming in the morning, then even more swimming in the afternoon! I'm fairly practised at this, ahem, but some bits were new to me - particularly body surfing stoppers, and all things chest harness/live bait related (though my BA doesn't have a harness, so I had to borrow Ems' when it was my turn!). We finished up with a tension diagonal (safely getting people and kit across the river using ropes). Not done that before.. my lack of harness meant I was the last to go, eek. walking up river - harder than it looks! Sunday's half of the course was a little drier, and briefly actually involved paddling our boats. 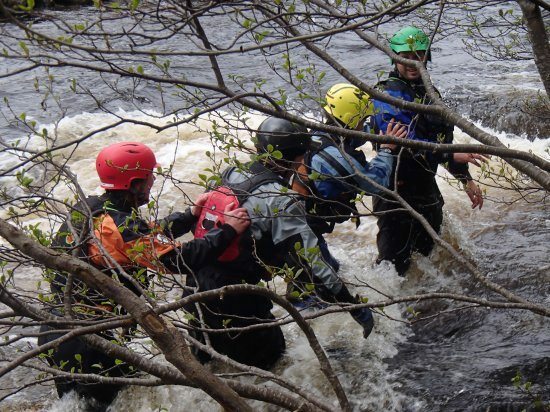 We covered boat rescues, safe group paddling, pins, foot entrapments and wading upstream (in pairs, or a 'wedge' formation). The day ended with some scenarios, and a lot more throwlining/swimming. Overall conclusions? We all need more throwline practise! My aim was better than I thought, but I mostly fail on actually holding on to the rope when it's got a person on the other end. It's good to have different people explain things as well sometimes, as obviously people have their own ways of doing things - we've all picked up a nifty trick to help with throwline repacking.